Upgraded the antenna systems (4 bay 9.5 DBi quads) and gained 2 s-units of signal in marginal areas like Manchester. It sits to the west tucked in behind Green Peak on the southern end of Dorset. Major improvement in coverage. Antenna and coverage map below. 147.570 PL100. Tested with TYT9000D at 25/65 watts with a Comet CA4x2SR 3.8 DBi gain mobile whip. 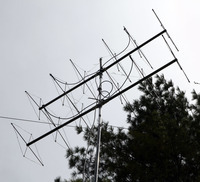 Your results will vary depending on the power/antenna/radio you are using while mobile.